When you're enjoying some relaxing time in the hot tub or pool, you don't want to get out to plug in your music. When you're enjoying some relaxing time in the hot tub or pool, you don't want to get out to plug in your music. Aquatic AV's AQ-AUX-4 input plate lets you decide where you plug in. Using its 53” cable, you connect the USB and RCA outputs to an Aquatic AV receiver's inputs. You can then mount this plate closer to the action, which lets you plug in a USB drive or portable music player. Both the input socket and cover are splash-proof to protect the connections when they're not in use. Note: The USB port will not support iPhone control, although it will charge your device. Flush-Mount USB/Aux Extension Cable: Aquatic AV's AQ-AUX-4 flush-mount USB/Aux extension cable connects to the rear-panel USB port and stereo RCA auxiliary input on the back of your Aquatic AV marine receiver or other brand of marine receiver, and provides a convenient connection for your USB and Aux source devices. Note: The AQ-AUX-4 does not support CarPlay or Android Auto. Connections: The AQ-AUX-4 extension cable features one male USB (type-A) connector and one female USB (type-A) port, as well as male stereo RCA jacks and one female 3.5mm minijack. 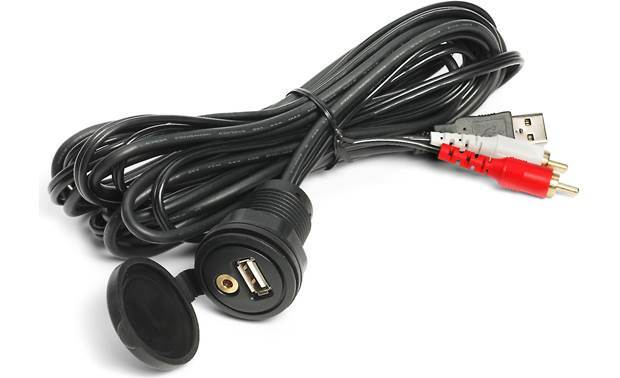 USB: The extension cable's male USB (type-A) connector plugs into the rear-panel USB (type-A) port of your marine receiver. The extension cable's female USB (type-A) port lets you connect your USB source device. 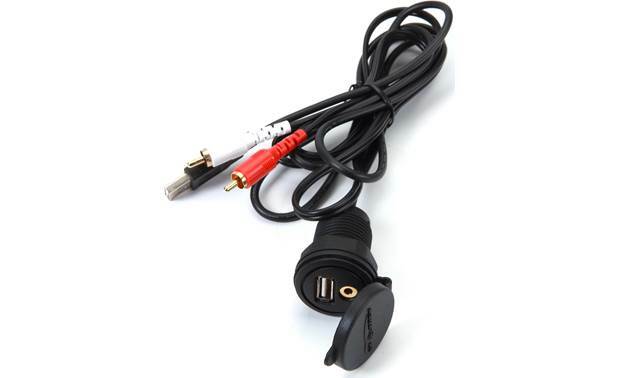 Aux: The extension cable's male stereo RCA jacks plug into the rear-panel stereo RCA auxiliary input of your marine receiver. The extension cable's female 3.5mm Aux input lets you connect your portable audio device. Mounting Options: The female USB port/Aux input of the extension cable features a flush mountable design. Simply drill a 1" hole at the desired mounting location, feed the extension cable through the hole and insert the female USB/Aux connector into the hole, and then use the included threaded locking collar to secure the flush-mount USB/Aux connector in the cutout. Searches related to the Aquatic AV AQ-AUX-4 Splash-proof USB and auxiliary input plate.